Cute killer whales star in this good-looking pokie from Aristocrat, that’s been popular at casinos worldwide for a number of years, and for several good reasons. Firstly, the appearance, but also the nice and easy gameplay that throws in a couple of bonus rounds such as a choice of free spins with multipliers, along with scatter wins, extra rows of symbols when needed and an impressive total of 243 ways for symbols to line up and pay out prizes. It all adds up to another quality game from a trusted developer whose pokies all have high return to player ratios and nice animations to really click with players. The design of this pokie may not be anything particularly ground-breaking, but that’s not the point, as it has been developed to appeal to a wide audience, many of whom will be relatively new to this sort of game. Behind the reels is a typical undersea picture, with the ocean floor rolling gently along the bottom of the screen. It’s a bit barren-looking to be honest, so most players will largely ignore it. We see the traditional layout of 5 reels and to the sides of them it declares that the Reel Power system is in use, which may sound a little daunting, but it simply means that players pick up a win by landing 3 or more symbols on adjacent reels running from the left side and don’t have to land them across any fixed paylines. It also means that players have the option to activate the first 3 reels only, but this will severely limit the maximum win values and most will choose to play across all 5, which equals a bet of just 0.30, which can be raised to suit the budget. 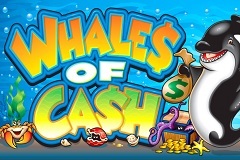 Like just about every other Aristocrat pokie, Whales of Cash has the playing card 9 through to A symbols spinning up the smaller wins. Although these are perhaps over-used, the plus side is that players know the relative value of each and at least they are presented in bright colours. To grab bigger wins, the picture symbols will need to land across the reels, with an octopus, starfish, oyster and treasure chest all adding to the underwater experience. Each time one of these icons makes up a winning line, it becomes animated, with the octopus waving it’s many arms around for example. The killer whale is top of the food chain here, landing on reels 2 and 4 only, but acting as a wild symbol, so it can replace any other if it’s able to complete a winning combination, doing an impressive backflip each time it does so. Our happy orca will also double the value of any line it completes in the base game when landing on reel 2, or quadruple it when also appearing on reel 4, while unusually, it will also substitute for the scatter symbol. The scatter is a bag of cash and despite it being called a scatter symbol it isn’t really, as it has to land on at least 3 adjacent reels from the left side, just like any other basic symbol to create a winning line. But the amount paid is a multiple of the triggering bet, with 5x, 20x or 50x returned to the player when 3, 4 or 5 appear. Three or more scatters also take players to the free spins bonus round, where they are given a choice of how they want them to play out. The options are to go for 20 spins on standard reels with 243 ways to win, or 10 spins on reels that have a fourth row of symbols and 1,024 ways to win. Whichever is picked, the whale will multiply wins by 4x or 8x if it completes any further lines throughout this round, while landing 3 or more scatters again will re-trigger the whole feature once the current spins have finished. A fun design may be what attracts people to Whales of Cash initially, but to keep them coming back it’s got lots more to it than just good looks. Thanks to the 243 ways to line symbols up, basic gameplay should see frequent winning lines, although players shouldn’t expect to win much for landing the playing card symbols and will really be wanting the pictures to turn up. It’s the wild multipliers and free games that really set this one apart, with the optional number of spins and rows of symbols. It’s worth noting that the actual returns will be similar, so players who like lots of free spins should go for the 20 games and anyone who just wants more winning chances should go for the 10.